The community of Manshayet Nasr, nestled on a hill inside Cairo, is home to over 500,000 residents, whose livelihood is earned mostly by collecting and sorting the city’s trash. This special group of Cairenes, known as zabaleen or “garbage people,” also manage to recycle over 80% of the trash they collect! One challenge of this business model is that in order to support their family garbage businesses, many children stop attending to school, which limits their future career options. To create more sustainable livelihoods for residents of this community, one of HANDS’ local Egyptian partner organizations, Association for the Protection of the Environment (APE), offers opportunities for women from the neighborhood to take part in income generating programs. Focused on handicraft production training with environmentally conscious practices, the women learn new skills that can provide additional income for their families. 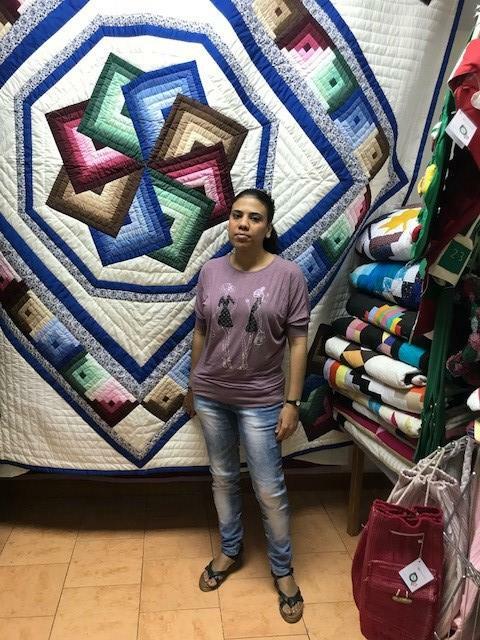 Rahma was one of the first women from the zabaleen community to learn the art of making quilts from recycled scraps of fabric, 15 years ago. She became a home producer after completing the training, enabling her to earn additional income for her family. This prompted her two sisters to follow in her footsteps, becoming home producers as well. Although Rahma was able to earn an income and help raise her family’s standard of living, she still wanted to pursue her education. She managed to enroll in high school and received her diploma, but she wasn’t content stopping there. Rahma was admitted to Ein Shams University and, four years later, graduated from the Faculty of Arts, a rare accomplishment in the zabaleen community, especially among women. During this time, Rahma also continued to work as a quilter, providing an ongoing source of income for her family. This HANDS-sponsored program changed Rahma’s future, opening new paths for her to pursue her dreams. She now is employed by APE as a teacher for the children of the women who train and work there. Two years ago, she was promoted to be the director of the school, where she administers classes for 300 children. Since she has taken over as director, the students’ exam scores have gotten higher, and the program continues to be a success. Her passion for education is being passed on to the next generation of zabaleen children. HANDS is honored to support the work of the Association of the Protection of the Environment, which not only empowers women like Rahma to achieve financial stability but also encourages them to pursue their education and keep their children in school, helping to break the cycle of poverty for the next generation. No Comments to "Rahma: Master Quilter, Trash Recyler, School Director"